For two tense weeks in mid-2013, developmental biologist Magdalena Zernicka-Goetz was chasing a world record. She and her colleagues at the University of Cambridge, UK, were attempting to grow human embryos in the lab for longer than had ever been done before. They wanted to glean insights into how a tiny blob of cells transforms itself into a complex, multipart structure. Previous efforts had stalled after about a week, but Zernicka-Goetz knew there was much more to learn about human development beyond that point. The researchers started with embryos that had been donated by women who no longer needed them for in vitro fertilization (IVF) procedures. The team bathed the cells in a special medium and housed them in an incubator, using methods adapted from their previous work on mouse embryos. Because the samples had to stay in a strictly controlled environment, the scientists could remove them only once or twice a day to track their progress under a microscope. The days ticked by — six, seven, eight. And still, the embryos continued to thrive and develop1. “We would hold our breath,” recalls Zernicka-Goetz. “Each day was more and more exciting.” The team reached 12 days on its first attempt, eventually stretching to 13. “This was just unbelievable. I was so delighted,” she says. Their advance, and a similar feat by a group based in New York City2, is one of a few achievements in the past five years to heat up the study of early human development. Researchers’ access to the human embryo has always been limited, and they knew relatively little about its early transformations. But now, refinements in cell-culturing methods are enabling them to grow human embryos outside of the body for up to two weeks. Scientists are using gene-editing techniques, such as CRISPR, and building artificial embryo-like structures to explore the cellular signals and physical forces that shape the embryo and its supporting cast of tissues. These techniques are illuminating key early processes, such as implantation — when the minuscule embryo embeds itself into the uterine wall and can’t be studied directly. And new high-resolution, digital images are revealing in fine detail how muscles and nerves grow a few weeks later in development. Such discoveries could lead to a better understanding of how birth defects and developmental disorders arise, as well as why some pregnancies fail. Many early developmental processes are surprisingly similar throughout the animal kingdom, with each species tweaking a few genes here or signals there. Among mammals, scientists have studied the mouse molecular instruction manual the most, disabling genes one by one to test what they do. Mice are easy to obtain in the numbers often needed for experiments, and are considered a decent proxy for studying human embryonic development — many of the earliest cell types and components seem similar in both species. But researchers are starting to question how far these similarities really go. “As we’ve been able to explore early human development a little bit, it’s become apparent the mouse and human embryo are similar, but not the same,” says developmental biologist Janet Rossant at the Hospital for Sick Children in Toronto, Canada. With a limited supply of human tissue available, scientists have turned to highly efficient gene-editing technologies such as CRISPR–Cas9 to explore the early stages of embryo development. In part owing to ethical sensitivities surrounding genetic modification of embryos, only a few groups have received authorization to perform such studies so far. At the Francis Crick Institute in London, developmental biologist Kathy Niakan led the first project of its kind to receive approval from national regulators. In 2017, her team reported using CRISPR–Cas9 to edit a gene expressed in both human and mouse embryonic stem cells3. Human embryos with disruptions to this gene lacked a protein called OCT4 and failed to develop into blastocysts — balls of roughly 200 cells. By contrast, mouse embryos lacking the same gene formed blastocysts and faltered only later. The difference supports the growing idea that, even in very early development, some genetic details — such as when certain genes are active — might be specific to humans. “We know that most IVF embryos will fail to develop to the blastocyst stage,” says Niakan. The reasons for that are unclear. “Understanding which pathways might be responsible for specifying the first cell types in the embryo could potentially lead to improvements in IVF.” In future work, Niakan hopes to examine the human genes that commit a tiny fraction of blastocyst cells to forming the embryo proper, as opposed to supporting tissues such as the placenta. After blossoming into a 200-cell ball, the little blastocyst must embed into the uterine wall to survive. But once this happens (around day seven), scientists are largely unable to study its development. Observing the implantation process itself is the first challenge: until recently, researchers lacked reliable methods for sustaining embryo development beyond the first week. Embryos that latch onto the dish are flatter than the real thing. (Brivanlou likens the attachment process to a parachute landing.) But the cultured embryos nevertheless went on to hit several milestones expected from animal experiments and from limited studies of human tissue samples collected after miscarriages and from other sources. In the latest experiments, after the embryo attached to the dish, an outer cell layer began differentiating into early placental and other cell types that support embryonic growth. Internally, cells seemed to develop into precursors of the embryo proper and yolk sac — an early structure supplying blood to the embryo. After almost a fortnight was up, both teams ended the experiments, in accordance with the 14-day rule. By then, some of the embryos had stalled in their development, but with further improvements, the researchers say, these culture systems could help to uncover much more detail about the embryo’s first two weeks. 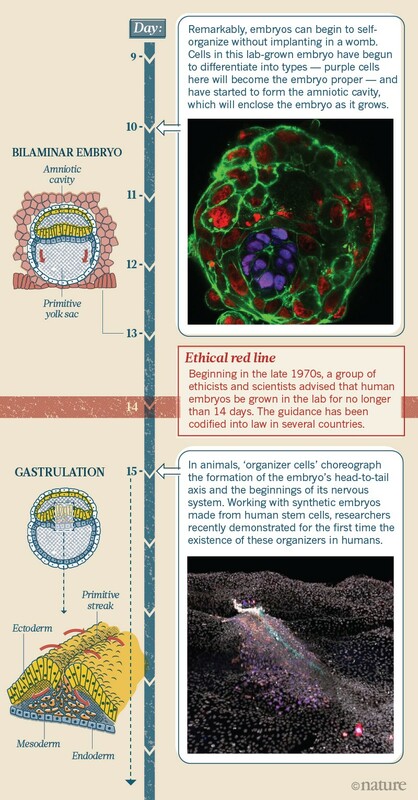 Several key events happen in the third week, during a process called gastrulation. The embryo starts to develop a body axis with one end destined to become the head. And cells start to migrate and differentiate into the three layers that will eventually produce all of the body’s organs and tissues (see ‘Baby steps’). The importance of this process was a major reason for imposing an ethical limit of 14 days. But some researchers are finding alternative approaches, using human stem-cell technology to construct synthetic embryo-like structures, which are not covered by the 14-day rule. These constructs lack certain components essential for full development, and couldn’t give rise to a human if implanted. In 2014, Brivanlou, Eric Siggia and their colleagues at the Rockefeller University reported mimicking gastrulation in vitro using specially grown human embryonic stem cells4. They found that when stem cells are confined to grow in circles measuring a few hundred micrometres across, they differentiate into a bulls-eye pattern containing the three main cell types that give rise to all parts of the future body. In nearly all animals, from flatworms to primates, these cell types have been found to have a similar role: cells in the centre become skin, brain and nervous system; in the next ring, muscle, blood, bones and various organs; and in the outer ring, the digestive tract and respiratory system. The flattened rings don’t look like the 3D triple-decker sandwich that forms in real human embryos, but at a cellular and molecular level, the construct did just what researchers expected. “Here’s a system where we can really dissect relationships between signalling pathways and cell fates,” says Aryeh Warmflash, a former postdoctoral fellow in Siggia’s lab. Follow-up studies of the system have already revealed new details about how embryonic cells use geometry and chemistry to self-organize into distinct tissue types. In 2016, Brivanlou, Siggia and their teams demonstrated5 that stem cells can sense their position in the circular colonies and, accordingly, adjust how they respond to molecules called growth factors, helping to form discrete zones of cells. And in a preprint posted to the bioRxiv server in 2017, Warmflash’s group at Rice University in Houston, Texas, demonstrated that the dynamics of growth factors have a role, too; the researchers saw that a surge in signalling by a particular set of proteins — collectively called the Nodal pathway — spreads from the colony perimeter inwards like a wave, leaving different cell types in its wake6. Brivanlou’s group has taken the system even further, showing in May7 that treating these types of colonies with a combination of growth factors induces the formation of ‘organizer’ cells. In animals, these special cells direct their neighbours to form a head-to-tail axis. But, in part because of the 14-day rule, scientists had never seen human organizer cells in action. Given the ethical and technical limitations of working with human embryos, Brivanlou instead grafted clusters of putative human organizer cells onto developing chick embryos, and watched as the grafted cells directed chick cells to develop into a second chicken nervous system. Much research on early human development has focused on the embryo itself, but many other tissues are crucial to its survival. These include the amniotic sac, which houses the embryo, and the placenta, which provides oxygen and nutrients. To better study how the amniotic sac develops, researchers created a model using human stem cells. Last year8, developmental biologist Deborah Gumucio and bioengineer Jianping Fu at the University of Michigan in Ann Arbor and their colleagues showed that when they grew human stem cells on a gel bed and surrounded them with natural scaffold molecules, the cells self-organized into a clump resembling the amniotic sac. After about 24 hours, a hole opened up and, subsequently, cells began to flatten on one side and elongate on the other, characteristic of the process leading up to gastrulation. The model replicates only the core of the embryo and its sac, with none of the other supporting tissues it would need to be viable; however, the researchers were still able to identify some of the molecular signals that could help to give rise to this asymmetrical structure. “There’s so much good information to be found, there’s no reason to push this in any way to get close to making embryos,” says Gumucio. The scientists maintained their embryo-like cultures for up to 5 days, corresponding roughly to developmental days 9–14, at which point they ended the experiments. Zernicka-Goetz’s team is trying to develop more-complete structures. In 2017, the team cultured a combination of two types of mouse stem cell: those that form the embryo itself, and some that help to form the placenta, called trophoblast stem cells. Embedded in a 3D scaffold, this synthetic structure grew to resemble the embryo after implantation9. 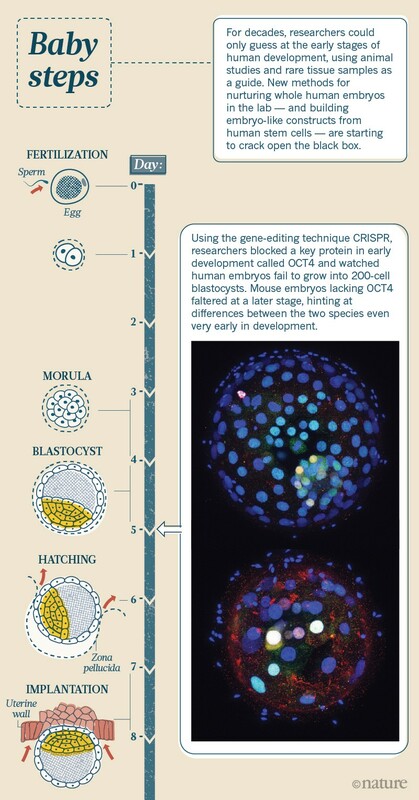 Now, the researchers are working on creating a similar embryo-like construct using human stem cells. Such a development could help scientists to learn more about the cross-talk between embryonic tissues and extraembryonic ones, such as the placenta. Researchers are also making strides in unlocking details from later phases. Many of these advances come from better tissue staining and imaging. In a 2016 report in Science, researchers at the University of Amsterdam’s Academic Medical Center digitized 15,000 slices from a collection of tissues maintained by the Carnegie Institution for Science in Washington DC. The collection houses samples obtained from miscarriages, surgeries and autopsies, beginning in the 1880s and continuing over the first half of the twentieth century. In the Dutch study10, which spans the first 2 months of development, the researchers digitally traced the outlines of up to 150 organs on individual slices, and then aligned the sections to reconstruct 3D models of the original embryo, available as an interactive atlas. Studying the embryos in high resolution has already led to a few discoveries. For instance, the team found10 that the kidneys, which are thought to ascend, and the gonads, which are thought to descend during development, only seem to rise and fall within the body because they grow at different rates compared to the vertebrae. But one major limitation of the Carnegie collection is its lack of molecular markers, which makes it difficult to distinguish different cell types. To address these issues, Alain Chédotal at the French National Institute of Health and Medical Research (INSERM) in Paris published in 2017 a new 3D atlas of 36 human embryos and fetuses spanning weeks 6–14 of development11. Chédotal and his team applied a tissue-clearing treatment to the donated specimens to make the samples easier to image under a microscope, and they stained them to highlight various cell types. The resulting 3D images show, in high-resolution detail, developing nerves, muscles, lungs, and other organs. “In terms of detail, there was nothing like that before,” says Rui Diogo at Howard University College of Medicine in Washington DC, who has mined the data set for information on how limb muscles develop. In still unpublished results, Diogo’s team has observed a number of hand and foot muscles that disappear or fuse during development. “When we are embryos, we have muscles we don’t have as adults,” he says. Among other unexpected findings, Chédotal reported that, although the gross organization of nerves is similar in the left and right hands, the fine branching patterns in each hand diverge and strike out along different paths in the first 7–11 weeks. As scientists refine and improve their techniques, they hope to learn much more about human development, and to shed light on the causes of pregnancy loss and birth defects. As an embryo’s earliest days come into sharper focus, so too do discussions of the ethical limits. Zernicka-Goetz’s and Brivanlou’s extended experiments have led some to suggest that the time is ripe to re-evaluate the pros and cons of the 14-day rule. In May, the Baker Institute Center for Health and Biosciences at Rice University hosted a meeting of 30 US scientists, ethicists and other experts, including Brivanlou and Johnston, to discuss whether and how to move the boundary. “I think it’s better to keep the 14-day rule in place and have a special petition to make an exception,” says Hyun, who also attended the event. Shahbazi, M. N. et al. Nature Cell Biol. 18, 700–708 (2016). Deglincerti, A. et al. Nature 533, 251–254 (2016). Fogarty, N. M. E. et al. Nature 550, 67–73 (2017). Etoc, F. et al. Dev. Cell 39, 302–315 (2016). Shao, Y. et al. Nature Commun. 8, 208 (2017). Harrison, S. E., Sozen, B., Christodoulou, N., Kyprianou, C. & Zernicka-Goetz, M. Science 356, eaal1810 (2017). de Bakker, B. S. et al. Science 354, aag0053 (2016). Belle, M. et al. Cell 169, 161–173.e12 (2017).